With a wealth of quality ingredients, and a history of traditional dishes, it’s not difficult to come to Rioja with high expectations. Drive through the valley covered in blossoming cherry trees and vines, and it doesn’t take long to fall in love. But to truly understand the heart and soul of Rioja, you must be willing to open your mind, and your palate, to a vast array of new flavors. Rioja is known as a hotbed of outstanding produce which provides the foundation to its simple yet quality driven gastronomy. From grapes that craft internationally recognized wines to lettuces, peppers, onions, artichokes, garlic, tomatoes, asparagus, beans, peas and peppers. And let’s not forget its notable goat and lamb products whose aromas can be savored when tossed over grapevines on open pits. The question being, when visiting this stunning land, what food should you absolutely not pass up on your next gastronomical trip to northern Spain? Piquillo Peppers (pimientos riojanos): Typically small and sweet, they are generally skinned and cooked before serving. Perfect fresh, but also great gently wood-roasted and preserved in their own juices, piquillo peppers are ubiquitous in the traditional cuisine of Rioja. You can find them stuffed (with bacalao or lamb); dipped in batter and fried, to make pimientos rellenos; and sometimes part of a stew, especially the substantial bean-and-chorizo stew, pochas a la riojana. Esparragos Blancos: This white asparagus is a regional specialty from Rioja Baja, prized for its tenderness. To obtain it, farmers must mount dirt around each asparagus shoot daily as it tries to poke out of the soil. As a result, these shoots never see sunlight, which is what makes them so tender. Typically you will find them canned and served with mayonnaise. Otherwise, they can also be grilled and salted, and used in many different kinds of dishes including salads, soups, omelets and other egg dishes. Patatas a la Riojana: Many of you have tasted Patatas Bravas, a typical tapa throughout Spain, but I doubt you’ve tried this version. Spain is not known for its spicy food – even black pepper is looked at cautiously; but here in Rioja, the potatoes are cooked in a stew with the spicy chorizo to delicious effect! Chuletas Riojana: Perfectly grilled lamb chops over vine cuttings – magical! As you bundle yourself against the slight chill in the autumn air, it’s rare you won’t also find your stomach rumbling from the delicious smell of grilled chops carried in the smoke cascading across the valley. It’s torturous, fantastic, and absolutely worth dropping in any number of harvest festivals to get your lips on these sumptuous bites of meat. Lechal (suckling lamb) or Cochinillo (suckling pig): Both of these are usually under 6 weeks old and still milk-fed.. Roasted with olive oil, or butter, and traditionally cut using the side of a plate (yeah, it’s that tender), you won’t want to miss this. PS – Suckling pigs can be very dangerous!! Huevos a la Riojana: This dish is typically made in two stages. First, the sauce (similar to a ratatouille) is prepared with various sautéed julienne vegetables: usually tomatoes, peppers (green and red), onions and garlic, accompanied by sliced ? ?potatoes and sausage. Stage 2 welcomes the fried egg on top, though some variants are made with a boiled egg. 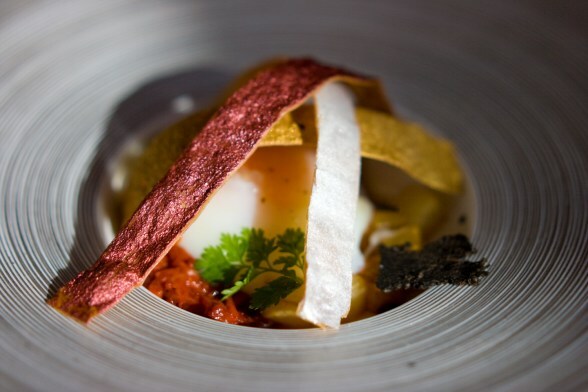 Rioja also boasts of many other egg dishes, but this is by far one of our favorites. Let us know your favorites! !